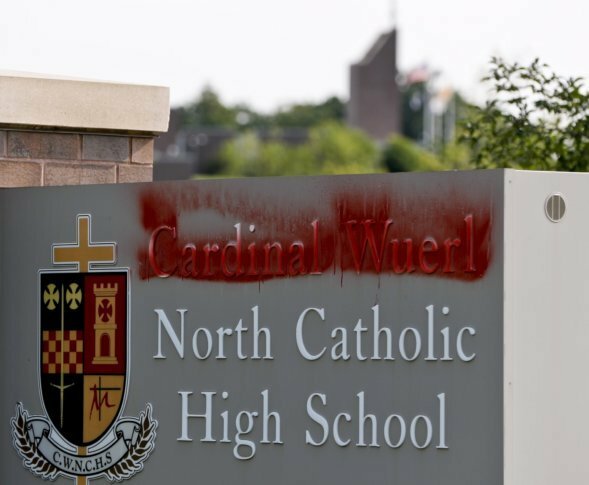 A school employee at Cardinal Wuerl North Catholic High School reported the vandalism to the school's sign shortly after 7 a.m. Monday. WASHINGTON — A Pittsburgh-area high school named for Cardinal Donald Wuerl has been vandalized days after the release of a bombshell grand jury report that faulted Wuerl’s handling of priests who sexually abused children. Wuerl is now the archibishop of Washington. A school employee at Cardinal Wuerl North Catholic High School reported the vandalism to the school’s sign shortly after 7 a.m. Monday, Sgt. Chuck Mascellino, with the Cranberry Township Police Department, said. Wuerl’s name on the sign appeared to be crossed out with red paint. Under Pennsylvania law, defacing a school is considered “institutional vandalism,” and the misdemeanor charge can be punished with jail time, Mascellino said. North Catholic High School, which is about 20 miles north of Pittsburgh, has carried Wuerl’s name since the 2013 school year, said Rev. Nicholas Vaskovm, the communications director for the Pittsburgh diocese. The release of the Pennylvania grand jury report has prompted some alumni to call for a change to the schools name. The petition has garnered more than 6,600 signatures. Overall, the grand jury report tallied up more than 1,000 child victims and more than 300 so-called predator priests across six of Pennsylvania’s eight dioceses. Wuerl is not accused of abuse himself, but the report — released by Pennsylvania Attorney General Josh Shapiro — said he protected some priests accused of abuse. Wuerl has defended his 18-year tenure as bishop in the Pittsburgh diocese, saying he implemented reforms, including a zero-tolerance policy. The grand jury report does show Wuerl, at times, took a more aggressive approach in handling accused abusers — sending one priest to a psychiatriac facility and traveling to the Vatican to personally lobby for the removal of another.